You want software that can help you easily optimize the operation of your Mac but also keep it safe? iMac Cleaner is the right program for you. This utility highlights a large number of tools that are grouped in the left menu. Its main function is to help you clean your Mac of all unnecessary files, especially if your machine does not have much storage space. It can also display information about the software that is installed on your Mac and help you uninstall it properly. iMac Cleaner also offers utilities such as a module to compress a PDF file, a RAR file extractor. The software is fully compatible with the latest version of macOS and offers a 30-day trial version to test all features. MacClean 3, a free utility for Mac, has just launched a new version to help you do a great spring cleaning with the cleaning, optimization, security and privacy modules. 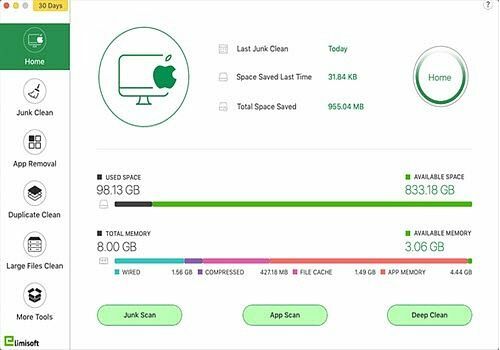 AppCleaner is a free software available on Mac that allows you to permanently delete a program and its associated content in order to free up space on your hard disk. MacCleaner is software available on the Mac App Store that allows you to clean and optimize the operation of a Mac. Among its many features, it supports the TouchBars of the latest MacBook Pro. Dr. Cleaner from Trend Micro is a software that allows you to restore the performance of your Mac to its former glory, but also to remove all unnecessary items that take up space on your hard drive. CleanMyMac X is software designed to help you clean and optimize the operation of your Mac. It includes more than a dozen different tools and offers an intelligent analysis that detects all the problems of your machine.